CapitalClimate chart from NOAA/NCDC data, background image © Kevin Ambrose (www.weatherbook.com). Includes historical daily observations archived in NCDC's Cooperative Summary of the Day data set and preliminary reports from Cooperative Observers and First Order National Weather Service stations. All stations have a Period of Record of at least 30 years. The surge of early spring heat records reached over 400 yesterday alone in preliminary reports from the National Climatic Data Center. This includes 68 official National Weather Service locations out of 290 possible records. In other words, over 23% of all official reporting locations in the entire U.S. set new daily records for March 15. This brings the total number of new heat records for the month so far to 1757, which is 18.7 times the number of cold records. Including the number of ties, the total number of record high temperatures for March to date is nearly 2300. 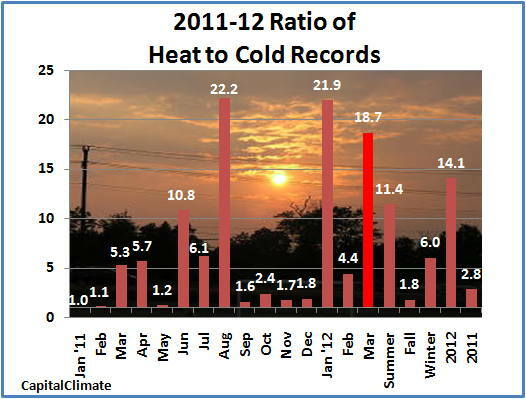 For the year to date, the ratio of heat records to cold records is over 14 to 1.